Travellers paid more for their domestic tickets in 2017, while corporate international fares remained flat and leisure travellers paid on average 4.3% less for their long-haul tickets. According to the latest 4D FOCUS – AUSTRALIA Aviation and Airfare Analysis, compiled by Flight Centre Travel Group’s 4th Dimension Business Travel Consulting division – (purchased) domestic economy corporate and leisure ticket prices rose, on average 3.5% and 8.9% in 2017 respectively. 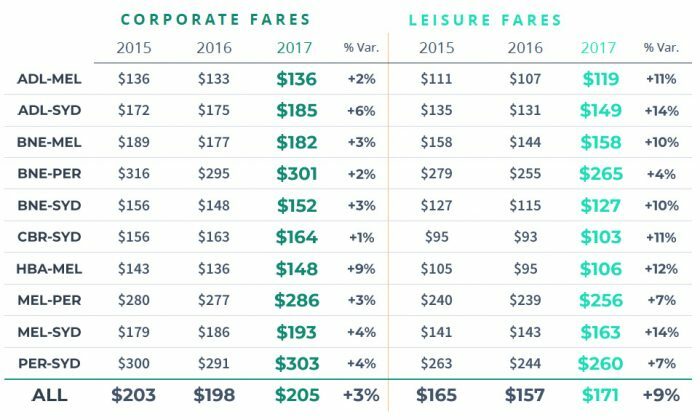 The report includes a benchmarking study that compares tickets purchased from FCTG’s corporate and retail businesses in 2017 compared to 2016 and 2015 airfares. Felicity Burke, General Manager of 4D, said the ticket increases the business had witnessed during the year in the domestic space had been driven by strong consumer demand, steady tourism growth and gradual increases in carrier published fares. Felicity said the positive news was that international economy fares for corporates had remained flat in 2017 and leisure travellers had another year of excellent value, low-priced long-haul fares. With approximately 62 airlines now servicing the international landscape, Felicity said Australian travellers continued to be ‘spoilt for choice with carriers, flight frequencies and in-flight product’. FCTG Managing Director, Graham Turner, said the golden era of travel continued to shine brightly for travellers. “Competitive international airfares, new direct flights such as the Perth to London, more frequent services, continually improved in-flight amenities plus unprecedented discounting on some routes are but a few of the positive takeaways from 2017,” Mr Turner said. Qantas’ recent start of non-stop services between Perth and London is the first of new city pairs to be offered by the airline as it welcomes new long-range aircraft to its fleet. Qantas is also targeting ultra-long haul flights from the east coast of Australia to London and New York by 2022. John Simeone, Qantas’ Head of Business and Government Sales, said in the report, ‘We’re seeing growth across all markets including the resources sector and the arrival of new aircraft allows us the chance to open new routes, just like Perth-London’. The report indicated that Virgin Australia continued to focus on its guests’ travel experience rolling out wi-fi across the majority of its fleet, introducing Melbourne to Hong Kong flights in 2017 and commencing Sydney to Hong Kong services in July this year. Some of the key findings in 4D’s report are below. Those corporates travelling on the ADL – SYD and HBA – MEL routes incurred the largest economy increases of 6% and 9% respectively. Leisure economy travellers flying BNE – PER saw the smallest increase of 4%. Felicity said the increase in in-bound visitors and domestic tourism, had also impacted the availability of domestic seats with load factors reaching nearly 80% in 2017. “The demand for domestic seats in the leisure space was very strong last year, which has also affected ticket prices,” she said. The 4D report indicated a 2.5% and a 4.6% increase for corporate and leisure domestic fares during the next 18 months provided the carrier mix remained the same along with a positive outlook for the domestic economy. International airlines continuing to adjust their networks from and to Australia, and deploy new aircraft for an improved flight experience. Qantas Network – departure 85.1%; arrival 84.4%. An England Ashes cricket tour to Australia is always one of the most highly anticipated sporting visits to this country. The return of the English Men’s and Women’s cricket teams for their respective Ashes campaigns is the culmination of months of planning to ensure both series are a success on the field for players, spectators and for all stakeholders. Planning commenced for the 2017-18 season some years in advance by Cricket Australia as the host nation with the England and Wales Cricket Board; and travel, transport and accommodation by sports and entertainment travel company Stage and Screen Travel Services. With the England squads touring in Australia from October to February The Ashes series will ensure a highly attended summer of international cricket in Australia. Tiziano Galipo, General Manager Stage and Screen Travel Services said, ”The Ashes is a long and complex tour to arrange and requires close cooperation between all parties involved. Stage and Screen are required to book over 8,800 hotel room nights across 12 different hotels with over 1,100 bags of luggage required to be transported. Transport arrangements include booking 36 internal flights and 270 vans, cars and coaches to move the teams and support staff around the country. Additionally, the teams will use over 37 dozen cricket balls for training on top of the match balls. The five-match Magellan Ashes Test Series commenced on 23rd November 2017 in Brisbane and is followed by five Gillette One Day Internationals and a Twenty20 Trans-Tasman Tri-Series involving New Zealand. The Commonwealth Bank Women’s Ashes Series has been played in Brisbane, Coffs Harbour, Canberra and North Sydney from 22nd October to 21st November 2017. Stage and Screen is Australia’s leading entertainment and sports travel company, widely respected for its people, credibility and discretion. The company lives and breathe sports and entertainment. Its long-standing client relationships have provided expert insider knowledge. Matching its Travel Managers with its clients, Stage and Screen delivers extraordinary travel experiences for Sport | Music, Touring & Arts | TV & Production | Film | Creative Industries. Daydream Island Resort and Spa in the Whitsundays has commenced its demolition program ahead of its long-awaited redevelopment with the cleaning out of damaged facilities as construction gears up to commence in November. The redevelopment program is on track for an October 2018 soft opening after a $65 million redevelopment following damage caused in March by Cyclone Debbie. Daydream’s Director of Sales and Marketing Jayson Heron said that bookings will be reopening for Daydream from 16th October 2017 for stays from October 2018 onwards. “We are very pleased to be able to reopen bookings for the resort,” Mr Heron said. “The interest level is high and we look forward to unveiling final details of the redevelopment in the near future. Daydream is opening up a sales and marketing office located at Chatswood in Sydney. Enquiries for Daydream Island Resort and Spa bookings can be made on the toll-free number 1800 075 040. Major works already announced will include redevelopment of the Arrivals pavilion, Reception, main Atrium area, Waterfalls restaurant, Lagoons bar, all room types and Mermaids Restaurant. Additionally, the Lovers Cove function area will be expanded and a new Asian-inspired restaurant will be built. The resort’s conference facilities will also be significantly revamped and expanded. 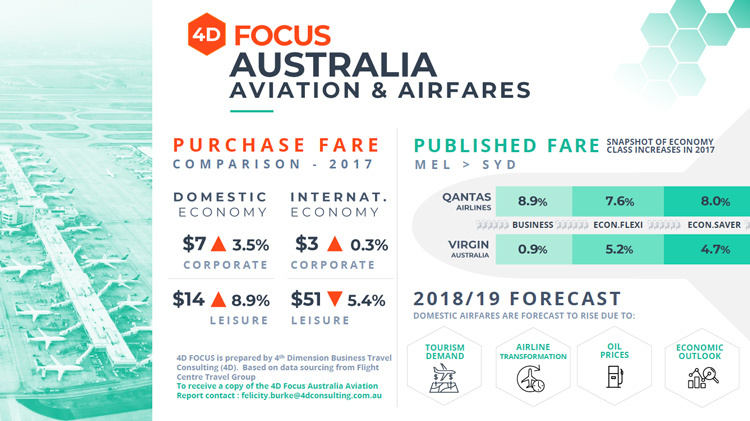 SME business travellers will face incremental airfare increases in 2018 but the passenger experience will be better than ever according to the latest 4D FOCUS – Australian Aviation and Airfare Analysis. The report, produced by Flight Centre Travel Group’s (FCTG) 4th Dimension Business Travel Consulting (4D) team, includes a statistical outlook for 2017 and year on year benchmarking of corporate and leisure airfares from 2014 to 2016. Corporate Traveller General Manager Jess Anscombe said despite some forecast increases on the most popular domestic routes, the uptick in airfares would be offset by the increased quality of the passenger experience. “Qantas and Virgin Australia have shifted from capacity battles to focus on shoring up their product. Both are vying for customer loyalty by introducing innovative new features on the ground and in the air,” she said. Ms Anscombe said the continued investment of both carriers to boosting their fleets and facilities pointed to the underlying value for money proposition being delivered to business travellers. The report also suggested a shift from the long-held belief that booking 14-21 days in advance delivers the best fares on the busiest routes. The introduction of Days of the Week fares in late 2016, which made certain fare types more expensive for travel on Thursdays and Fridays, being the clearest disruptor. Ms Anscombe said the report also highlighted the continuing strong demand in key SME destinations of Sydney, Melbourne and Auckland with resulting cost increases for accommodation. “Historically, airfares are still very competitive but using some professional expertise to match the market’s dynamic pricing is the best way to ensure you’re accessing the best airfares every time,” she said. 4D’s General Manager Felicity Burke said key international routes for SME travellers continued to show outstanding value. “Flights between Sydney and Shanghai have dropped an astonishing 27 per cent in the last three years, the biggest fall of any major international route,” she said. “Sydney and Los Angeles were the next best performing flights dropping 16 per cent in the same period. In an Australian and New Zealand first, Airbnb, the world’s leading community driven marketplace, has partnered with Flight Centre Travel Group’s (FCTG) corporate division to provide corporate customers with more options when travelling for business. With five different corporate travel brands, FCTG corporate, offers the broadest range of travel management services for organisations across Australia and New Zealand. The new partnership with Airbnb means that FCTG’s corporate brands will now have an unrivalled pool of accommodation options to offer its corporate customers. FCTG’s corporate brands, including FCM Travel Solutions, Corporate Traveller, Campus Travel and Stage and Screen, will have access to Airbnb for Business. The new accommodation offering will give FCTG’s corporate customers access to more than three million listings worldwide, which are available to be booked through the home-sharing platform. Since its founding in 2008, Airbnb hosts have welcomed more than 180 million guest arrivals at Airbnb listings worldwide. Approximately 10 per cent of all travellers on Airbnb are business travellers, and in 2016, the number of business trips on Airbnb tripled. Through this partnership, FCTG’s corporate travel brands will have access to Airbnb’s third party booking tool. Additionally the travel manager and the employee who is taking the trip, will be able to see trip details, make changes to the reservation, and message the Airbnb host with questions about the listing or neighbourhood. Andrew Flannery, FCTG’s Executive General Manager of Corporate Travel, said today’s agreement would bolster the company’s award-winning corporate travel offering. “Customers’ needs and preferences in the corporate travel sector are constantly evolving, and this agreement will deliver interesting new accommodation options that will appeal to sections of our customer base, particularly those who are looking to experience something a little different to a traditional hotel stay,” Mr Flannery said. “It will also benefit our corporate customers who are travelling to locations where there may currently be an under-supply of suitable hotel rooms. David Holyoke, Global Director of Business Travel at Airbnb said, “We are thrilled to be working with FCTG’s corporate travel brands, in this sector of the travel industry, and look forward to helping Australian and New Zealand business travellers feel more at home while on the road. FCTG have run a trial with one of their clients over the last few months and they are already seeing a positive impact for their employees travelling for business using Airbnb, with employees included in the trial rating the experience 4.76 out of 5 stars and with an average daily rate of of $80AUD. Airbnb listings will be available to Campus Travel and Stage and Screen in the coming weeks, and then progressively introduced soon after to FCM Travel Solutions and Corporate Traveller. Corporates have rarely had it so good, with a recent airfare study indicating the price of corporate Economy Class tickets dropped on key international routes in 2016 and fell by as much as 7% on the top domestic routes, according to the latest 4D FOCUS – Australian Aviation and Airfare Analysis. The report, which was produced by 4th Dimension, Flight Centre Travel Group’s (FCTG) business travel consulting division, includes a benchmarking study that compares the price of corporate and leisure airfares purchased in 2016 compared to airfares purchased in 2015 and 2014. 4D’s analysis of corporate and leisure tickets purchased through the FCTG’s staple of travel brands, demonstrates that Australian travellers continue to see excellent value from the price of their air tickets. Compounding the positive news for travellers is the fact that Australian airlines are heavily focused on improving the whole travel experience – from take-off to touch-down as they vie for customer loyalty. Since 2014, Qantas has upgraded 100 Airbus A330 and 737 aircraft with new interiors, opened new lounges around the country and the carrier is also on the verge of introducing free high-speed Wi-Fi in the domestic market. Meanwhile in the Virgin Australia camp – the brand has started a three month trial of testing in-flight Wi-Fi on its Boeing 737-800 aircraft. These are but a few of the perks travellers now enjoy when travelling for work or play. FCTG Managing Director, Graham Turner, said it’s been positive to see 2016/17 airfares remain competitive. “Airfares are still extremely affordable for domestic and international travel and I think despite some of the distractions we’re seeing globally – the corporate and leisure travel industry will continue to perform throughout the rest of 2017,” Mr Turner said. Below is a takeout of some of the key findings in 4D’s report. It was only on the MEL – SYD route, where capacity is tightly controlled by airlines due to the high volume of traffic, where travellers didn’t see a price reduction but rather wore a 1% increase on the average price of purchased fares. Felicity Burke, General Manager, 4th Dimension Business Travel Consulting, said the outcome of the latest research into corporate and leisure fare movement painted an extremely positive picture for companies and smaller businesses, as well as holiday travellers, that have been booking their travel through a travel management company or retail travel agency such as those that fell under FCTG. “Not only are FCTG’s corporate customers purchasing extremely well-priced fares but they are also getting all the additional value that comes with booking through a travel company such as 24-hour global traveller support, access to experienced consultants that manage their company’s travel policy, travel spend and activity reporting capabilities as well as access to our online booking technology,” Mrs Burke said. Fare tracking conducted by 4D for first Quarter 2017 indicates a moderate increase of between 3% – 5% in domestic Economy Class fares across both the corporate and leisure buying groups. Further to this, both the major Australian airlines introduced ‘Days of the Week’ fares late 2016, which has travellers on certain routes, with certain ticket types paying a higher price to fly on Thursday and Friday. The data collected suggests a definitive shift away from the long-held beliefs of travel buyers – that booking 14-21 days in advance delivers the best deal on the busiest routes. With a likelihood of one in 10 tickets being changed by corporate travellers after a ticket is issued, 4th Dimension highlights that customers should consider the benefits of ‘flexible’ fares to avoid costly change fees. Virgin Australia reintroducing a Melbourne to Los Angeles service. 4th Dimension research showed, that in the second half of 2016, there was strong demand for accommodation in Sydney, Melbourne and Auckland, as leisure and business travellers arrived in huge numbers for work, conferences and holidays. The upshot in demand fuelled accommodation rate rises in those cities, with hotel rates increasing two or three times more than what the traveller paid for flights. Looking ahead to the second half of 2017 and into 2018, room bookings in these metro hot spots are expected to continue, causing demand to outstrip supply in some cases during peak periods. Daydream Island Resort and Spa’s owners China Capital Investment Group (CCIG) has announced a more than $50-million-dollar redevelopment which will see significant infrastructure upgrades to the popular Whitsunday tropical island resort. The works will see the resort closing in early 2018 for a period of time to ensure renovations can occur in the shortest possible time and with minimal disruptions. Daydream Island Resort and Spa general manager Dawson Tang said the major redevelopment would see accommodation refurbishments as well as renovations to existing attractions and installation of new features which will transform Daydream into an upscale 4½ star world-class resort. “This is a very exciting development in the history of Daydream Island and for The Whitsundays,” Mr Tang said. “Our owners have recognised the need to revamp Daydream’s facilities especially as we embark on a greater push into international markets including the lucrative China market. “Prior to commencing the redevelopment in 2018 it will be very much business as usual this coming year. Major works will include redevelopment of the Arrivals pavilion, Reception, main Atrium area, Waterfalls restaurant, Lagoons bar, all room types and Mermaids Restaurant. Additionally, the Lovers Cove function area will be expanded and a new Asian inspired restaurant will be built. One of Daydream Island’s signature attractions, the Living Reef lagoons, will also be upgraded and receive some brand new features which will enhance interaction with guests. The resort’s conference facilities will be significantly revamped and expanded. To ensure minimal disruption to guests, some strategic projects will be implemented in 2017 on the South End of the island. Fish Bowl bistro, Boat House Bakery and Ginger’s Hut will be closed for a period from the first week in February this year. Alternative food and dining facilities will be provided. Access to South End facilities including swimming pools, the outdoor cinema, motorised watersports and the Endeavour Wedding Chapel will not be affected. CCIG purchased Daydream Island in March 2015 and has since completed many accommodation and facility upgrades and refurbishments plus a renovation to the resort’s main restaurant, Mermaids. Located in the heart of the Great Barrier Reef, the 4.5 star Daydream Island Resort and Spa offers 296 beautifully appointed rooms, comprehensive facilities such as the Rejuvenation Spa and Living Reef lagoon, a wide variety of activities, sparkling bays and secluded beaches, which all combine to provide a superior tropical island experience. AirAsia X has celebrated its 9th birthday with the arrival this morning on the Gold Coast of Flight D7 206 from Kuala Lumpur featuring a special 9th birthday livery dedicated to its guests and staff. Since its first flight in November 2007, AirAsia X has flown nearly 1.6 million passengers between Kuala Lumpur and the Gold Coast. The airline was the first low cost long haul airline to fly between Malaysia and Australia and introduce innovations such as premium flatbeds and a Quiet Zone, reserved for passengers aged over 10 years of age. AirAsia is celebrating 9 years in Australia with special one-way fares for two people to Kuala Lumpur from Gold Coast from $369*; from Melbourne and Sydney from $349*; and from Perth from $188*. AirAsia X has 11 frequencies weekly between the Gold Coast and Kuala Lumpur and in March commenced a daily service between the Gold Coast and Auckland, New Zealand. Benyamin Ismail, CEO of AirAsia X Berhad said, “We have expanded our operations rapidly since our humble beginning in 2007. We are now covering 23 destinations across four continents and grown our fleet to 30 Airbus A330s with over 19 million guests flown, and we’ve done it all within a decade. “This is definitely no mean feat and we couldn’t have done it without the dedication of our Allstars and the unwavering support from our loyal guests. “To top it all off, we’ve even commissioned an aircraft with a special anniversary livery dedicated for our guests and Allstars, as they are both the driving force behind the airline. “The past nine years have not been without its challenges for AirAsia X, but I believe that we have been through the worst and are now reaping what we have sowed from our on-going turnaround initiatives. “Returning to the black for three consecutive quarters is just a start; with solid hard work by the team and every Allstar we are confident to achieve full-year profit and take the airline to greater heights. “Special thanks go to our business partners, airport authorities, and tourism bodies who believed in us and supported us in our journey, including our AirAsia X Allstars who have made this dream possible,” Mr Ismail added. Queensland Airports Limited CEO Chris Mills said,” Gold Coast Airport and AirAsia X play an important part in each other’s history. The Kuala Lumpur – Gold Coast route was the airline’s first ever service and AirAsia X was Gold Coast Airport’s first long-haul international carrier to Asia when they commenced in 2007. “AirAsia X’s entry into the Australian market has proved to be a game-changer in affordability of international air travel, and we are delighted to have played a part in their success. Queensland Airports Limited own and operate Gold Coast Airport. AirAsia X has increased many flight frequencies in 2016. From Australia AirAsia X flies daily to Kuala Lumpur, Malaysia, from Perth (14 flights per week) Sydney (11 flights per week), Melbourne (14 flights per week), and Gold Coast (11 flights per week). AirAsia X started its operation in 2007 with its maiden flight to Gold Coast, Australia on 2 November. Since then the airline has grown exponentially, having carried over 19 million guests in total. With this milestone, 9 guests from 9 countries within the network were invited to share their incredible travel experiences. Check it out here at http://bit.ly/2eRuyAv. *Terms and conditions apply. Fares include airport taxes and surcharges. Limited availability, until sold out. Selected travel periods apply. Processing Fee of up to AU$10 may apply. Fee may not apply if you use PayPal. Booking valid until 6 November 2016. Available when booking for two people. The Bachelor Australia’s Richie Strahan has travelled in style to Bali in his quest for love as this season’s finale of the hit Network Ten television production reaches its peak. The latest instalment of The Bachelor Australia series saw Richie and the final three girls, Olena, Nikki and Alex fly to tropical Bali on finale week, as he chooses one lucky lady in his search for love. AirAsia X flew the cast and production crew to Bali aboard an Airbus A330 where Richie was able to enjoy the comforts of a premium flatbed seat before they hit Bali for filming at a resort in Nusa Dua, Bali. Linda Na, head of marketing for AirAsia in Australia, said the airline was delighted to be involved in the finale of the series. “This has been the highest rating series yet and features one of our most popular destinations in Bali, and hence it was a natural fit for us,” Ms Na said. “Aussies are still very much in love with Bali and we certainly hope Richie has found his true love. AirAsia X, together with AirAsia, provides Australians with low cost fares and access to over 120 destinations across 24 countries. AirAsia flies to Bali direct from Perth and Darwin, and via Kuala Lumpur from the Gold Coast, Melbourne and Sydney. For bookings or further information visit www.airasia.com. If you’re in the tourism industry and looking to enhance or begin your social media and online presence, then there’s some key considerations to think through and some planning required. Have a look at what other successful businesses are doing and learn from their efforts. Think about what types of online media your audience is likely to use. Is it Snapchat, Facebook or Twitter? Or something else? And don’t forget about TripAdvisor. Many consumers rely on online reviews for their decision making. Peer influence is very important in the process. Over 50% of Facebook users say their friends’ photos have inspired their choice of holiday and shaped their travel plans. Here are five key considerations to shape your tourism social media efforts: 1. Be informative Your goal should be to become an authority on your region and its attractions. Avoid the temptation to simply plug your own business at every opportunity. You will win a loyal following if you’re able to provide a regular flow of useable information that provides advice and tips for visitors. Provide accurate updates on local happenings and interesting events, new tourism product, travel conditions and yes, even the weather. Suggest a list of key things to visit, great photo spots, provide maps and amazing photos. If you employ an imaginative and informative content strategy it will help in SEO and have your business rank more highly on search results. If you give potential visitors value in terms of superior content, they are more likely to have a connection with your brand. 2. Be authentic Be real and believable. The effect of ‘gilding the lily’ can be a loss of confidence in your business by visitors and result in negative online reviews and an erosion of trust with your audience. Show what the experience is that visitors can truly expect – accommodation, activities, scenery, food and most importantly the character and characters around you. A rising tide floats all boats, so the more you can accurately enhance the profile of your region the better for you. There’s not a finite amount of success available. 3. Involve your audience Social media is very much a two-way street. Interact with and have a conversation with your online community. Ask questions, ask for feedback and invite them to contribute content. You’ll be amazed at how many gorgeous photos, stories and experiences can be shared from your own visitors. They’ll give you honest feedback and recommendations. Thank them for their reviews and don’t ignore their communication – good, bad or otherwise. Consider what competitions, promotions or incentives you can run on your platforms, big or small. Encourage guests to tag your accounts on their posts on their own pages. 4. Employ a content marketing strategy A lot of great content doesn’t happen by accident. Much of it is planned and thought out. A simple but effective tool is to utilise a content marketing strategy and it can be as simple as using a calendar. This can be a spreadsheet, online doc, or paper diary. What advice pieces can we create? Are we running any promotions for specific booking periods? Look at a theme for a certain period – e.g. to coincide with Mothers’ Day, or a local food festival.